Doveridge Hall, Derbyshire, from John Preston Neale’s Views of the Seats of Noblemen and Gentlemen in England and Wales, Scotland and Ireland. Seen here is a close up of the cartouche with Royal arms. It reads: "By his Majesty's Royal Letters Patent granted to S. Hawkins for an improvement upon Water Closets, No. 167 Fleet Street" and features pictures of each major element of the toilet, labeled with its terminology. 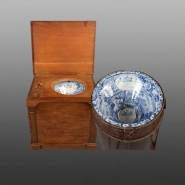 Seen here is the complete Hawkins portable water closet which consisted of a mahogany cabinet with hinged lid that opened to reveal a hinged wooden seat with a circular opening, over a ceramic bowl, in this case printed in the Grapevine Border Series pattern shown above. The bowl with hinged bottom was mounted to a tin collar, which was designed to fit into a removable slop bucket. A copper lined cistern cabinet was attached to the left side of the cabinet. Also positioned on the left side was a brass pull, a brass pump mechanism, and a small hinged opening for pouring in water. Steven Hawkins applied for a patent for his design in 1821 for which he received a royal letters patent in 1822. Water was forced from the cistern through a short pipe into the bowl and the weight of the water forced contents down into the bucket. The bucket would have been removed as needed to empty the contents. A close up of the view, Doveridge Hall, Derbyshire, printed on the bowl. An earthenware bowl designed for a water closet printed in blue with the view Doveridge Hall, Derbyshire. The source print for this pattern is from John Preston Neale’s Views of the Seats of Noblemen and Gentlemen in England and Wales, Scotland and Ireland (shown below).